In your dishwasher, thoroughly clean jars, lids and tops. Here are some canning 101 tips if you’ve never canned this before. 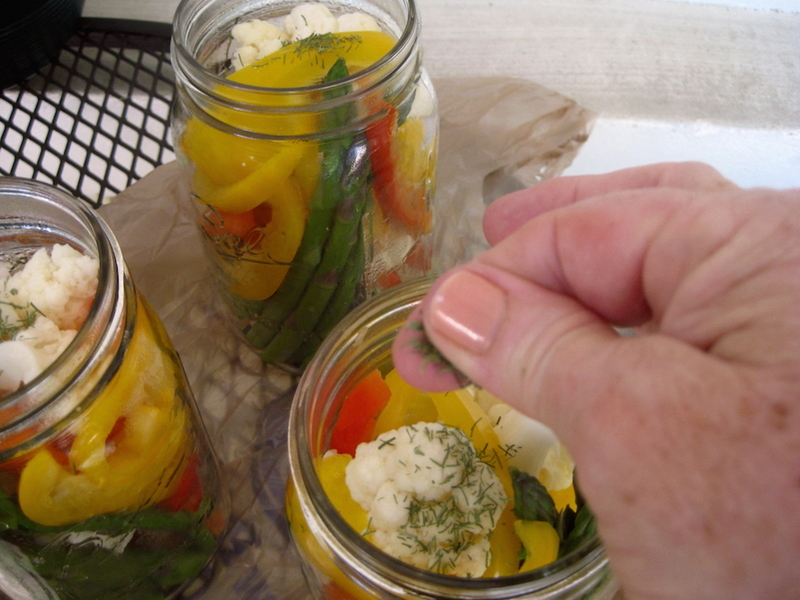 Meanwhile, wash vegetables and prepare for jars – lightly crush six garlic cloves (don’t mix them up because you need one clove per jar), thinly slice peppers, chop celery, cut cauliflower into bite-size clumps and chop off woody ends from the asparagus to a length that will fit into each jar (or cut them in half). Into the bottom of each jar, drop a garlic clove, 2-3 thyme sprigs, sprinkle of pepper flakes and 5-6 peppercorns. 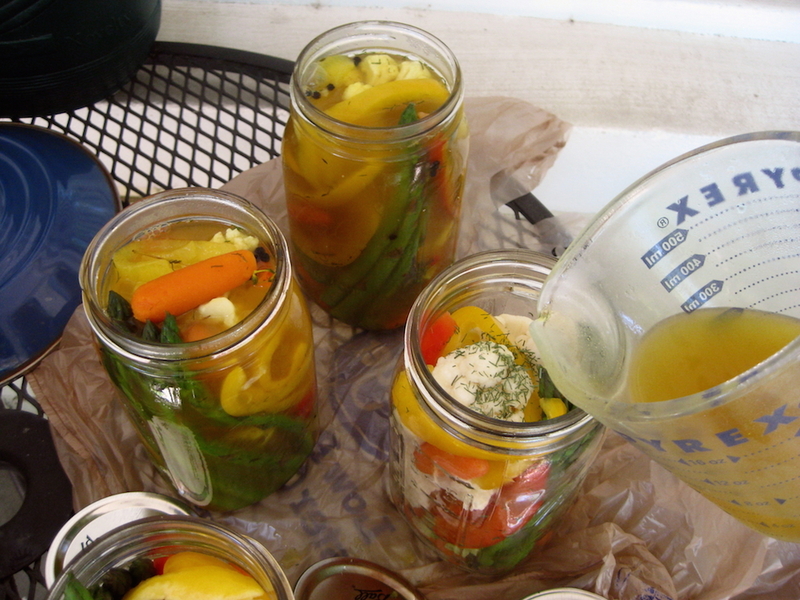 Then begin to layer or arrange carrots, bell pepper and celery into the jars. These don’t need to be blanched. Into the boiling water, add small batches of asparagus. I count to 20 then remove them with a slotted spoon into a colander to drain. Be careful not to heat these too long or they lose their crispness. Do the same thing with the cauliflower. When these are cool enough to handle, begin arranging them into the jars. 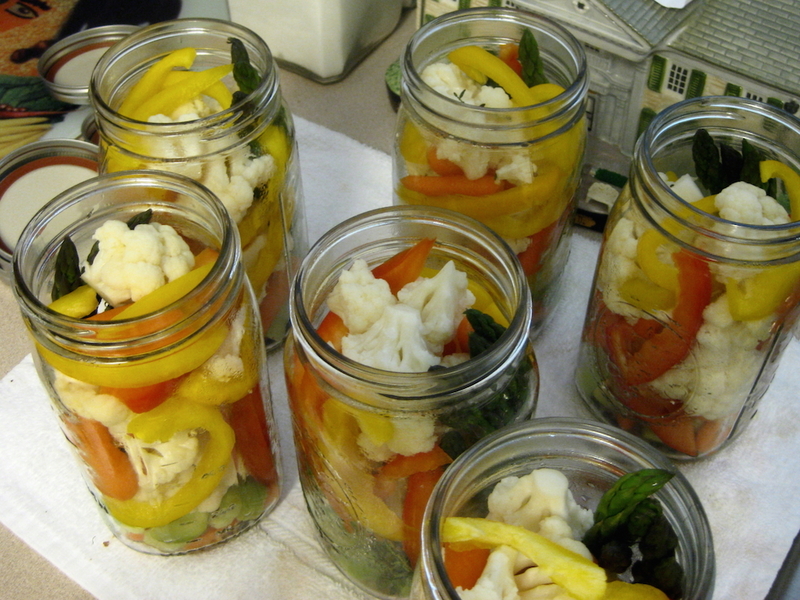 Continue layering/arranging the carrots, bell peppers, cauliflower and asparagus until you’ve tightly packed the jars. Sprinkle a little dill on top. Set the lid on each jar for a loose cover and set aside for the moment. In the non-reactive stewpot, add your pickling mixture – 1 head of garlic, 6 sprigs of thyme, 1 carrot, 2 small stalks of celery (heart pieces are good), sliced onion, water, salt, sugar, cumin, peppercorns, turmeric, cloves, bay leaves, dill and pepper flakes. 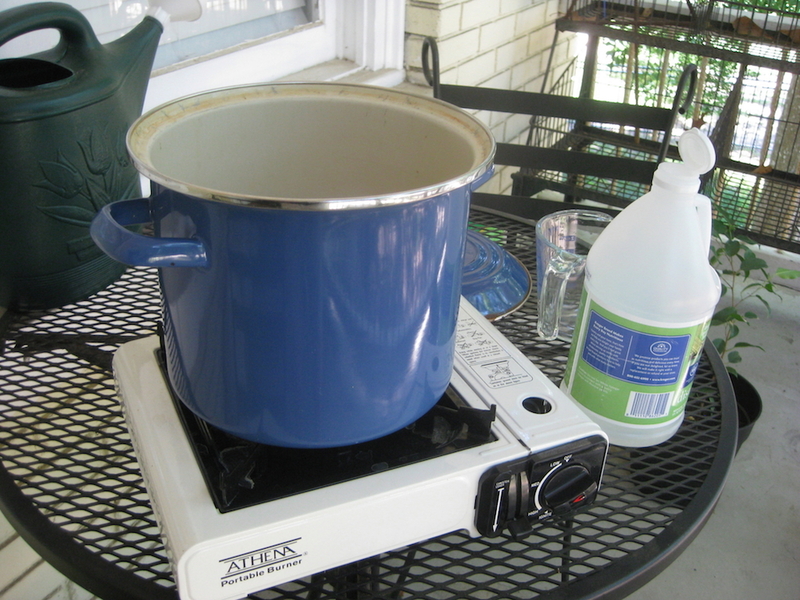 Start your outside burner and place pot on top, then add vinegar. Cover and heat on medium until it’s boiling and the onions have wilted. Should take about 15-20 minutes. While this is cooking, place newspaper or some other covering on your outside worktop. Now move all your filled jars outside to your worktop and remove the lids. If you don’t have an outside work space, you can do this inside but it will create a pungent odor. Open as many doors and windows as you can and turn your AC on to the “fan” setting to circulate fresh air. 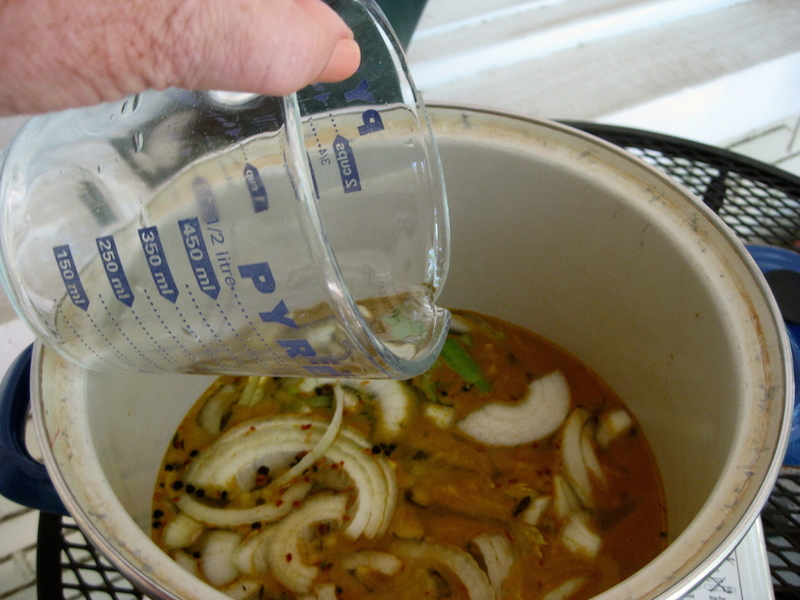 Once your pickling mixture has cooked, use a glass measuring cup to ladle the pickling mixture into each jar. Fill nearly to the top. Wipe the mouth of the jar, then seal with the lid, then softly screw on the top. Allow to cool, then tighten the screw-top. When jars cool, wipe the outside with a damp cloth, then move them to a countertop where they should stay for 24 hours before being refrigerated. They will be ready to eat in 7 days. They’ll “keep” well for weeks and months, although you and your company are likely to eat them all before then. Eat giardiniera like you’d eat pickles, like antipasto, atop salads or spoon in a serving bowl as an accompaniment to whatever you’re eating. Yum. Here are some more serving ideas from the New York Times. 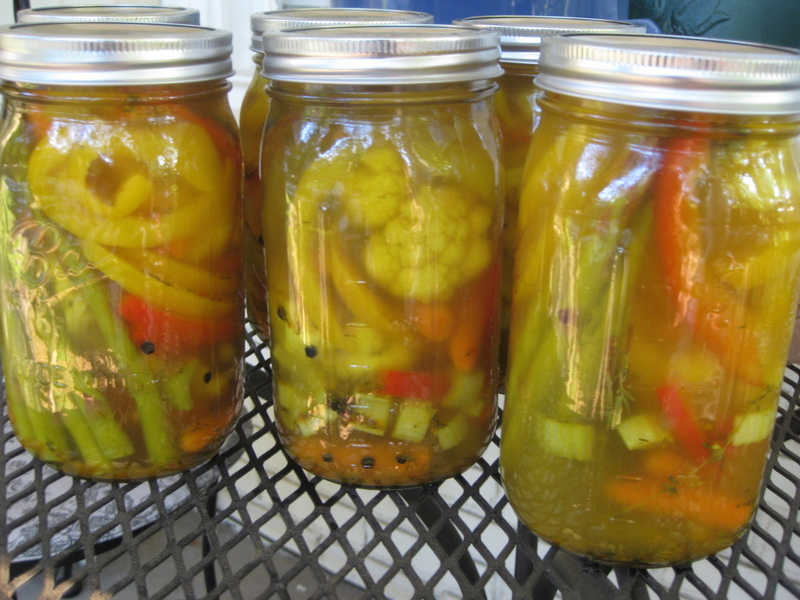 Let us know how your giardiniera turns out.